Step One. What is the painting for? One of my goals this year is to enter more art exhibitions, especially juried ones. Time permitting is a huge factor and I have a predetermined list of exhibitions with one already being crossed off. Time. We’re frenemies. Answering the question, this is for an open call exhibition with the stipulation of the canvas being 8×8 inches. Step Two. Find an image. When I found this exhibition listing I knew straight away what I wanted to paint. 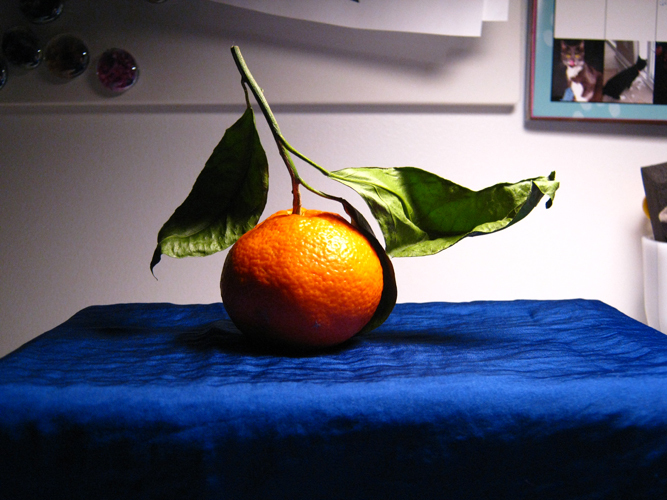 I had taken several photos of a Satsuma orange because I fancied painting a few still lifes that play with colour. Step Three.Crop and adjust image in Photoshop. See above for original photo. Since the final painting needs to be 8×8 inches I cropped the photo to those dimensions. I also adjusted the levels and added a background. Originally I was going to have a plan deep navy blue background but I eventually felt that would be too boring. PLUS I wanted to incorporate gold paint. I decided on an art deco inspired design of which the lines would be painted using the gold. Step Four. Prep the painting surface. Again, continuing with my new love of wood panel I decided to paint this on a Gallery depth Wood Panel. I gessoed the entire surface, including the back, at least four times with a light sanding in between coats. Step Five: Print out reference imagery and add grid lines. I decided to only do half of this step. I printed out the “good” reference image (good refers to the full colour print on double sided matte paper). Step Six. 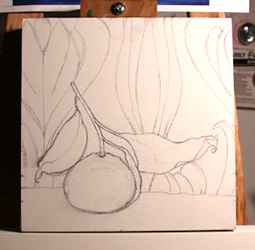 Transfer image onto painting surface. I transferred the image without using a grid. I just used my skills of observation with a few transfer marks on the canvas. I still decided to use pencil for this transfer because the image is on a smaller scale and I didn’t want to keep reloading my brush as I would have had needed to use a small fine one. It wasn’t necessary for me to draw the decorative design in the background but I did anyways. I wanted to get a sense of the design with the orange and it was practice for when I have to paint it on for “real” with the gold paint. Step Seven.Colour wash. 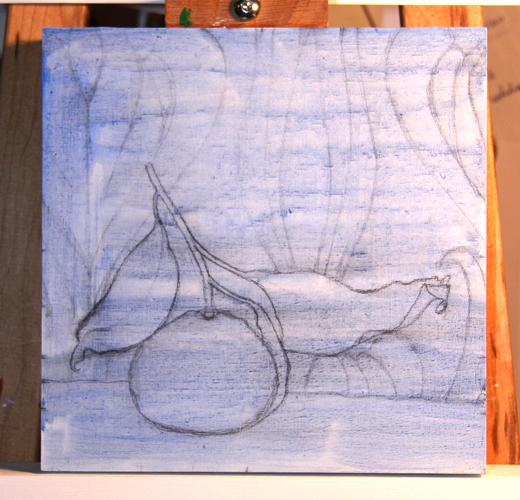 I sealed in the graphite with a light wash of ultramarine blue. I decided on that particular colour because I wanted to make the over all feel the painting to be on the cool side, with the exception of the orange. Step Eight. Paint. As I mentioned in my Poppy post I want to keep exploring colour with my paintings. 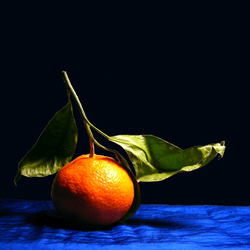 This painting will play upon the Complimentary Harmony of Orange and Blue. 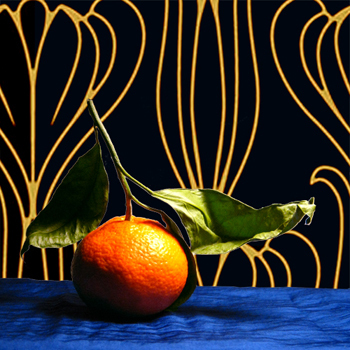 I also want to there to be a warm cool aspect happening between the satsuma and the shadows. The ground is also a warm hue of ultramarine blue but as you may notice the shadow is a cool hue that matches the background. The background is a Prussian Blue. Very velvety looking. I may go back into it to add lighter areas just for some interest BUT I might do that after I paint in the design. Still undecided on that front. My next step will be to work on the leaves then the ground. 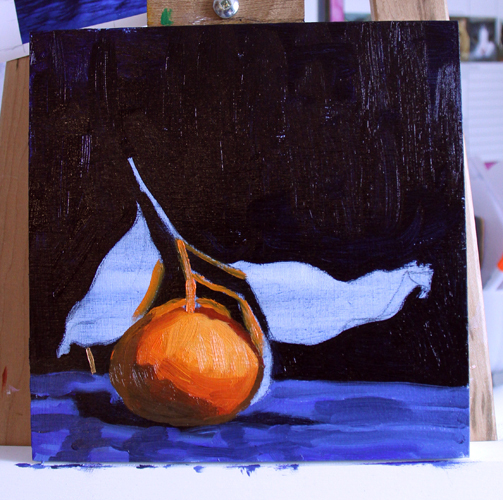 I suspect the orange will be too wet and only cause aggravation if I try to speed up the painting process. As you can see I did add one mark of gold. Ha ha ha, I couldn’t resist. FYI it looks fantastic against the Prussian blue!